Two weeks into the season and as expected, the Ducks offense hasn’t faltered. Vernon Adams Jr. fought through a broken finger to throw for more than 300 yards and extend Oregon’s streak of games with a passing touchdown to 70 in last week’s defeat at the hands of Michigan State. The defense improved in a much tougher contest than the Week 1 matchup against Eastern Washington, but ultimately fell short. The first loss of the year has turned each remaining game into a must-win situation if the Ducks hope to return to the College Football Playoff. A significant contributor to the small successes and tough luck defeat of the defense has been sophomore Arrion Springs, whose debut as a starting cornerback for the Ducks has not gone smoothly over his first two games. Springs’ tackling skills are unparalleled in the young secondary that head coach Mark Helfrich has already scolded for missing tackles. Limited playing time as a true freshman held him to grabbing only three tackles over 10 games, two of which were unassisted. Nevertheless, his skills stood out among a talented group, helping his case for winning a starting spot coming into this season. With a superb physical presence, Springs is what the doctor ordered for Oregon’s secondary. In his high school career, Springs showed an above-average ability to stop a play, racking up 75 tackles (46 unassisted) in his senior year alone. That trend has continued as he got to work quickly in the season opener, making seven tackles with two pass breakups. Last week against Michigan State his physical play improved, as he was involved with 13 total tackles –and he can take sole credit for six. The 5’11, 205 lb. sophomore has had little problem stopping receivers after the ball reaches their hands; unfortunately, his job is to kill plays before they get to that point, and he has struggled in that department. Oregon’s secondary is one of the youngest in the Pac-12, sporting two freshman, five sophomores and a single upperclassman — junior safety Reggie Daniels. The only other Pac-12 team without a senior in its secondary is the up-and-coming UCLA. 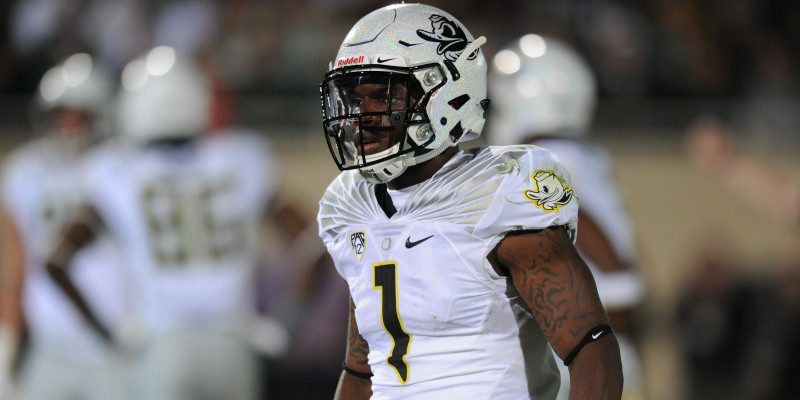 While Oregon is thin on experience in the secondary, the Ducks have no shortage of talent. Ty Griffin made an appearance as a safety against Eastern Washington, but it’s rumored he is being groomed for a cornerback role where his slight height advantage (6’0) could give him an edge over Springs. Daniels could see some competition after a slow start to his junior season. Entering the season, Daniels was tabbed to be the leader and anchor of the young secondary, but he has struggled in the first two games, as well. missing tackles and giving up big plays in on the second level. With Springs’ superb tackling ability and troubles with coverage, we could see shuffling of roles in the near future. 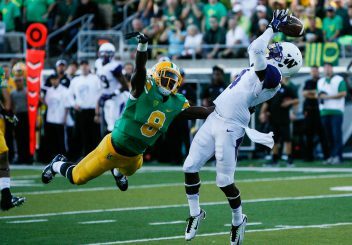 In order to take full advantage of the speed and power he possesses, dropping him to safety could be the answer the struggling Ducks secondary is looking for. The inexperienced defense has only two games under its belt and promises to improve as the season wears on. 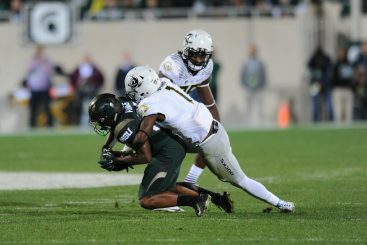 This week the Ducks will have an opportunity to iron out the kinks against Georgia State before conference play begins at home against Utah on Sept. 26.